StubHub was looking for a way to bring together its employees in a meaningful way, so they chose a team building event that would leave a lasting impression with participants to its office in San Francisco, California. In addition to selling tickets for the SuperBowl, StubHub has been providing a secure, easy way to buy and sell tickets for sporting events, theater, and concerts since 2000. The group for this event was primarily from their corporate office in San Francisco, California with some participants coming in from Boston, Massachusetts as well. The Build-A-Bike event consists of a series of tasks to be completed by the group, that can only be achieved by working with the members of their teams, and the other teams around them. Some members of the group tried to work by themselves or only with their team to complete the tasks, but they soon realized they needed to branch out and work with other people from other teams, providing the take-away that often we can accomplish more as a collective group than when we isolate. By the end, the participants built 6 bikes and had a lot of fun in the process. 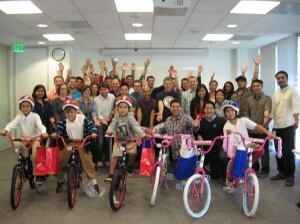 The bikes were donated to the Boys and Girls Club of San Francisco, who was able to bring the kids in at the end of the event to receive the bikes. The participants had no idea the kids were coming, and were thrilled to see their smiling faces. They helped them adjust the kids’ helmets and made sure their tires were fully pumped so that the bikes would be ready to ride! The kids were selected through a raffle conducted at the Boys and Girls Club, and were very happy to get a brand new bike. If your company is looking for a fun way to bring your team together, while also giving back to the community, Build-A-Bike is a great way to do so at your next convention!